Helping seniors and adults with a chronic illness or physical disability remain independent in their homes since 2002! 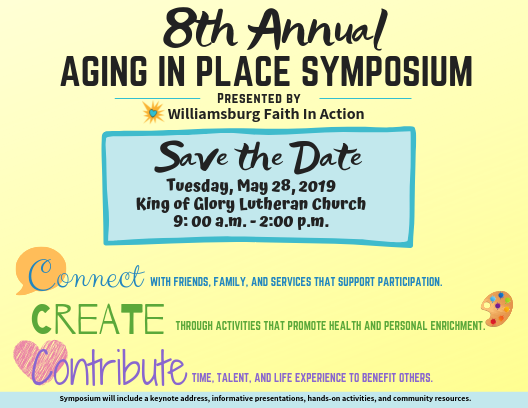 Faith In Action offers a wide variety of support services to help seniors in the Williamsburg, VA area remain happy, healthy and independent. Services provided include transportation, shopping, caregiver support, assistance with household chores, one-on-one visits, daily well-check calls, friendly phone visits and light yard work. Click the links above and below to learn more about the important work of Faith In Action! Event Details Here! Early Birds, Register Now for Just$5! Interested in being a vendor? Click here for more info! Ready to be a vendor? Click here to register! Scheduling services just got easier. Save yourself some time, and schedule your service online! Requests are automatically sent to a member of our staff. Volunteers make a great impact on the lives of those they serve. When you serve through WFIA, you will in fact make a great impact on the community around you. Williamsburg Faith in Action (WFIA) relies on donations and grants to meet our annual operating budget. Every contribution counts! Proud member of the National Volunteer Caregiving Network!